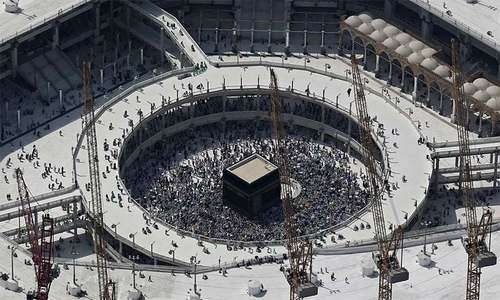 The Supreme Court (SC) on Tuesday dismissed the Ministry of Religious Affairs' appeal to increase the Haj quota of the government scheme from 60 to 70 per cent, upholding a ruling passed by the Islamabad High Court (IHC) in this regard. Last month, the IHC had ruled that 60pc of the Haj applicants would be able to go for the pilgrimage through the government scheme while the remaining 40pc would avail services of private tour operators. The religious affairs ministry had challenged the high court's ruling in the SC and appealed that the quota be increased from 60pc to 70pc. While the petition was pending with the top court, the federal cabinet, at a meeting chaired by Prime Minister Shahid Khaqan Abbasi, had agreed to slash the private Haj quota from 40 to 33pc, increasing the government quota to 67pc. Hearing the petition today, Chief Justice (CJP) Mian Saqib Nisar asked the deputy attorney general (DAG), who appeared before the court in today's hearing, if there were any legal shortcomings in IHC's ruling. The DAG responded in the negative and told the court that pilgrimage through government schemes was cheaper. The CJP also expressed anger at the cabinet committee for increasing the government quota from 60 to 67pc despite the high court's ruling. Upholding IHC's decision, the SC dismissed the government's application. Everyone must follow one scheme for Haj; ie through government.